15m high quality TV aerial cable with angled connectors. 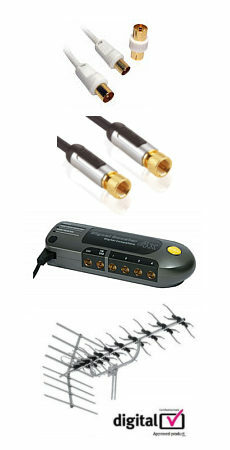 High quality coax conductors to minimise cable loss. 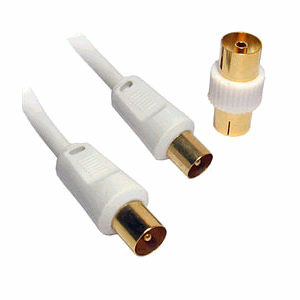 Angle plug to angle plug lead (male to male). White jacket, ideal for running around white skirting boards. Suitable for Analogue, Freeview and Freeview HD TV. This cable is compatible with analogue and digital TV including freeview HD. RG6 Satellite Cable 100m Drum / Reel High quality RG6 satellite grade coaxial cable. Double screened, braid and foil screen. Supplied on 100m drum. Ideal for LNB connections on Sky, Sky Digital, Sky+, Sky HD, Freesat and other satellite receivers and cable TV systems. Colour black, also available in white. Profigold PROV9001 High Quality 1m satellite dish cable for Sky, Sky+, Sky HD, Freesat Virgin Media and other cable TV connections. High quality F plug to F plug satellite dish aerial lead. 24k gold plated F-connector contacts and double shielded coax cable. Pearl chrome metal connectors with metal inner case. 99.9996% oxygen free copper conductors. Ideal for LNB connections on Sky, Sky Digital, Sky+, Sky HD, Freesat and other satellite receivers and cable TV systems such as Virgin Media. Length 1 metre.